London, the capital city of England is known for being the most populous city. Standing on the River Thames, the city of London gradually became the leading global city with strengths in commerce, arts, fashion, finance, healthcare, research and development, and transported all contributing to its supremacy. Though the city has numerous places to explore, something that will lure your attention the most is the street art in London. Street art, a phenomenon of 1990s, developed from the graffiti art, is today a regular occurrence in the streets of London; in some areas it is ubiquitous. Exploring street art in London can be of huge pleasure for those who are visiting the city for the first time.In London, there are hives around which the street artists buzz and rule supreme. Exposed to the depredation of urban life, street art is considered delicate, transient, and fragile – just like a butterfly in spring. It will not only reach out and touch your soul but will also enhance the quality of your emotions as you walk through the city. 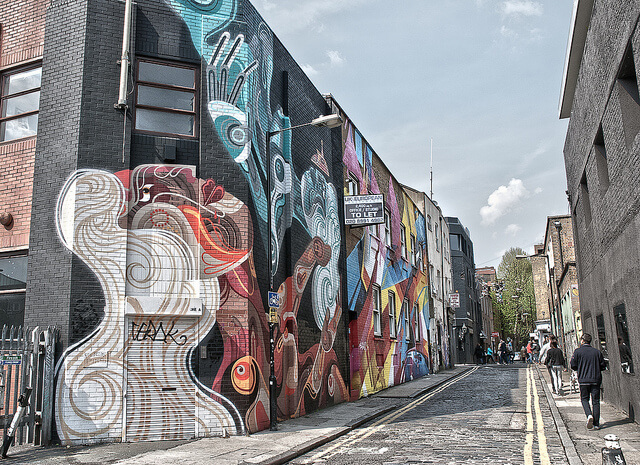 Your London holidays will be incomplete without exploring the beautiful street art. If you are planning to explore street art in London, it is important for you to go through the locations that will let you go through street art. One such popular destination is the London Borough of Camden. This town hosts a wide number of counterculture artist and musicians. Street artists love such places because they can flaunt their work in the best way. They also prefer brightening up a neglected building. Regent’s Canal is also noted for being one of the popular destinations for street art. Some parts of the canal have several amazing pieces that one must go through while holidaying in London. The famous Chalk Farm station in the city of London features street art that even includes the famous piece created by Bansky. In some parts of East London, you will get to see some fabulous street art. Once you travel to London city, you will come across many places of interests. From shopping destinations to cultural spots, you will get to see all in this city. Holidaying in this city will leave you refreshed and rejuvenated. London is famous for its world-class street art, No trip to London is complete without exploring the beautiful street art in London.